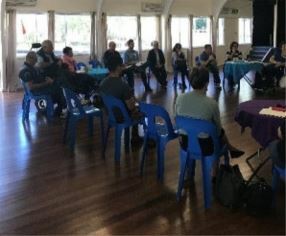 On 12 June, QDN local leader and Board Member Philia Polites with QDN CEO Paige Armstrong host a community conversation at Kallangur to talk to the community and people with disability about starting a local support group in this area. Over 20 people including representatives from disability services, community services, local council and people with disability came together at the Frederick Marsden Youth Centre to show their interest and support for this new forming group. At this meeting, Councilor Denise Sims from the Moreton Bay Shire Council offered to promote the group meetings in her newsletter to help let people with disability in the local area know about this new group. The support continued with Marsden Families offering to support the group through organizing catering and a meeting venue at their premises in Kallangur. Marsden Families are also using the meeting logistic including booking rooms, organizing catering and room set up as an opportunity to develop the skills of a young person with disability who works with the organisation. It was great to see so many energized people all excited to be in involved in being part of the establishing of this local group. Philia Polites who will be the Group Convenor for the Kallangur Local Support Group commented that a local support group in Kallangur is just another exciting way to bring people with disability together. With similar groups in North Lakes, Deception Bay and Caboolture the Kallangur group helps to fill in the tapestry of support for people with disability in the area. With the aim of the group to disseminate up to date information about State and Federal initiatives including the National Disability Insurance Scheme the group also gives people with disability the opportunity to discuss issues that affect them. Mrs Polites also stated that she expects lively meetings in which we can ensure “nothing about us, without us”. The first meeting of the Kallangur Local Support Group will be in August and it looks like this will be another great group with lots of engerised members ready to jump in to make this group a success. If you are interested in finding out more about the Kallangur Local Support Group, contact QDN at dso@qdn.org.au or phone 1300 363 783.